Valentine’s Day has always been one of my very favorite holidays! Growing up my mom would deliver a dozen pink roses to me and my sister while we were at school and after, we would come home to a box full of chocolate covered strawberries! Drew has been my ‘valentine’ for the last 5 years and he always has a way of making it so special, just like my mom did when I was younger. This year I’m going to be in NYC over Valentine’s Day so Drew and I decided to celebrate early! 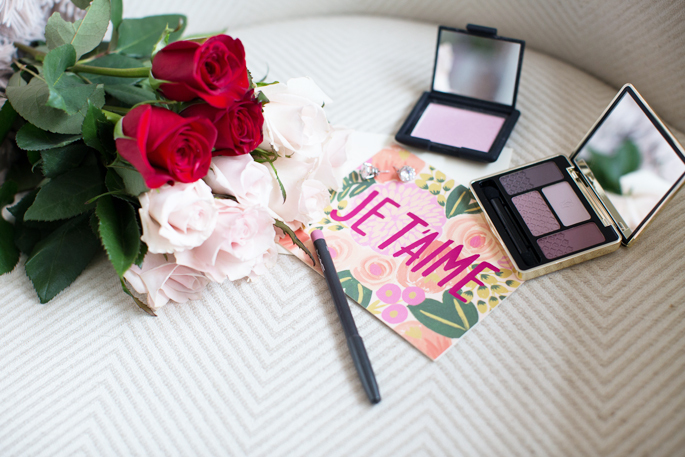 Before each V-Day rolls around, I try to plan out my beauty look a few days prior because I think every woman (myself included) wants to look and feel amazing on the most romantic day of the year! 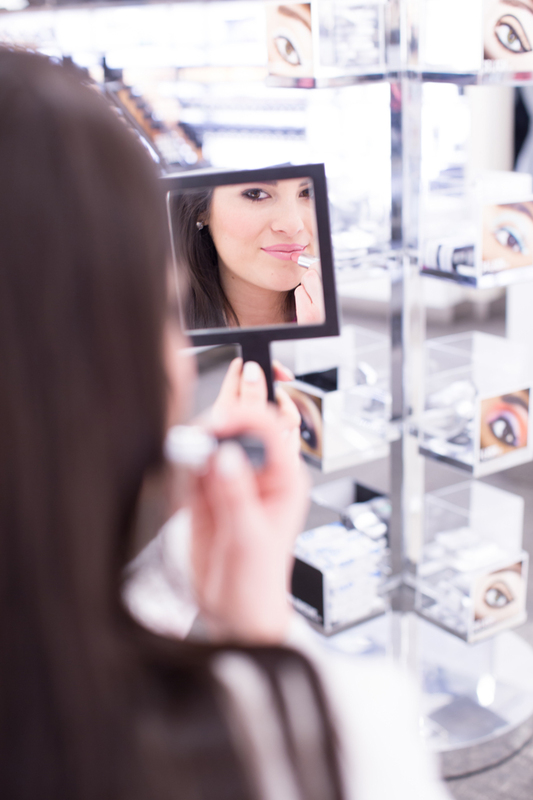 For our date, I wanted a soft and romantic feel to my makeup that looked fresh and natural so I stopped into the Nordstrom beauty department to grab a few products to complete my beauty look. I went with a plum smokey eye and a soft pink lip. Great post! Love all of the photos and that dress fits you perfectly! You two are lovely, especially the way Drew looks at you! Such a beautiful couple! Love all of your outfits and beauty looks, thanks for sharing! Such stunning photos!! Thanks so much for sharing! Every single detail is perfect. I love your make up selection, your dress, your coat and your bouquet of roses. All so stunning! Love this post! You look beautiful and Drew looks like a happy dad! God bless you! Great pictures and story telling in this post! It’s a great day to be grateful for all of your loved ones. 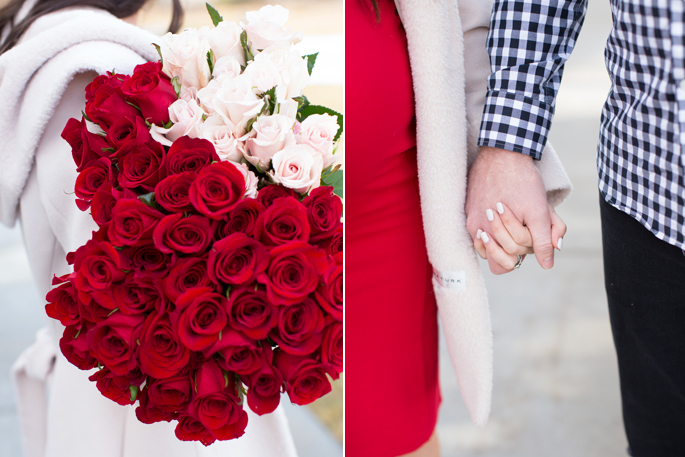 I like the red dress – I decided to go a little different this year and styled coral and white as v-day date options. Have fun in NYC! 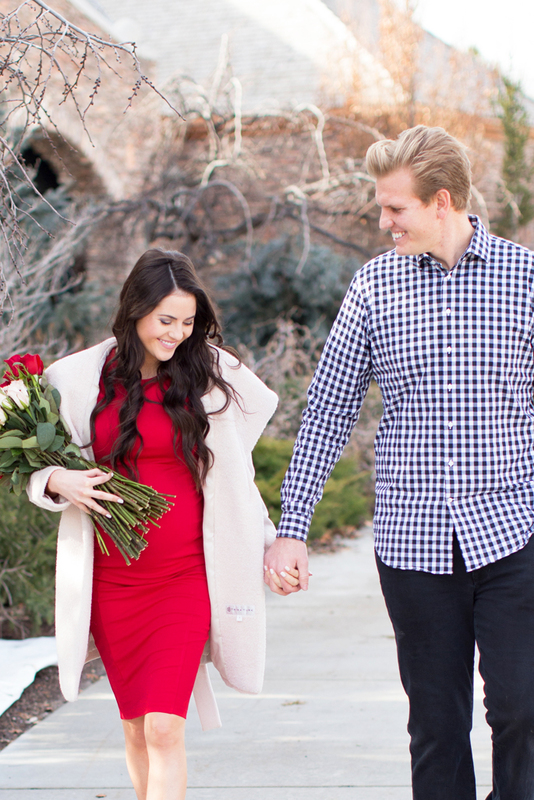 Such a great and simple look for Valentine’s Day…love your dress! You look so gorgeous! 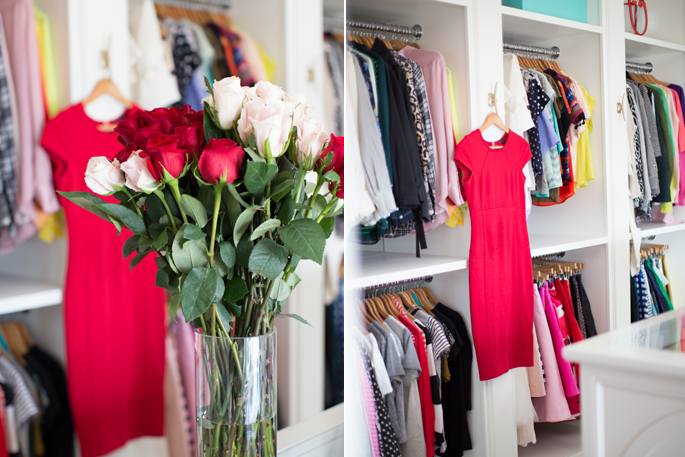 I love your Valentine’s look and your fabulous closet haha! Aaah I love seeing shots of you both, you’re such a gorgeous couple! The neutrals mixed with the red look amazing! Hope you enjoyed your night. These photos of you two are so cute! Loving this little red number! Such a sweet look! Love that dress, girl! Your baby bump looks so cute! Stunning! I’ve never noticed how much you and Emily look alike until this post…definitely sisters! Absolutely love! So gorgeous. What nail color polish is that? So cute! Love the blush heels paired with a red dress!! Love that red dress with the blush shoes, such a feminine look! loving your makeup for these shots! you and Drew look great! Happy Valentine’s Day! Dash is so cute with the rose in his mouth! That’s so sweet that your mom did that for you guys! Your dress is stunning! I love the dress and the makeup. You 2 make such a cute couple! Love this dress and coat! So cute how your mom would send you flowers to school. Enjoy your last Valentine’s Day before the little one comes! You look beautiful! I hope you and your husband had a wonderful Valentine’s Day celebration! You look gorgeous! Valentine’s Day is my favorite and this was such a sweet post. I love the pictures! Your early Valentine’s Day looked amazing! I hope you have a safe trip to NY :), enjoy those beautiful roses! Loving your coat, dress and heels! Looking elegant as always! you look lovely! beautiful flowers too! Beautiful photos! You guys look amazing! You look so beautiful with your cute bump! Nordstrom really has the best! I am off to the US this weekend for two weeks and can hardly wait for my endless tripes to Nordstrom! Hopefully see you at Fashion Week! Gorgeous pictures. You look so cute. Love the red dress with the blush coat! And Dasher is just as cute as ever! Your red dress is so pretty, that color looks lovely on you! You look sooo adorable in that red dress and with a bouquet of roses.. just perfect! Such a cute post! Love that dress!! Your makeup is perfection!! Your eyes look so beautiful! My favorite makeup look on your eyes. 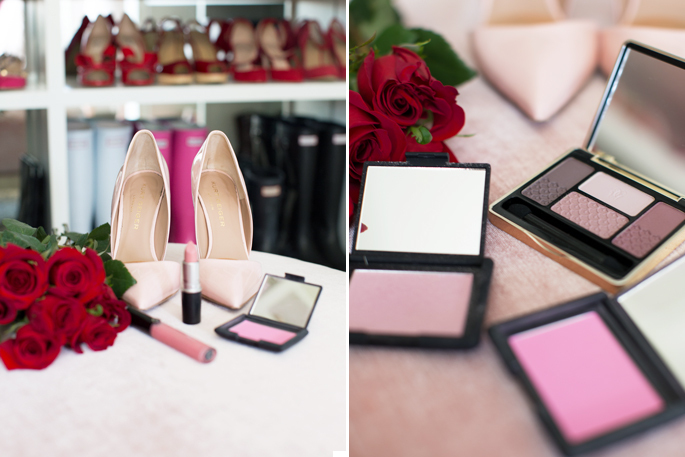 The blush is a favorite of mine! I love how you went with a glossy light pink lip. Your outfit is stunning. I love blush and red together. This must be such a special Valentine’s Day with you being pregnant!! Loved this special post! Awwww these photos are so cute! So stunning! You always have such a classic, beautiful look! 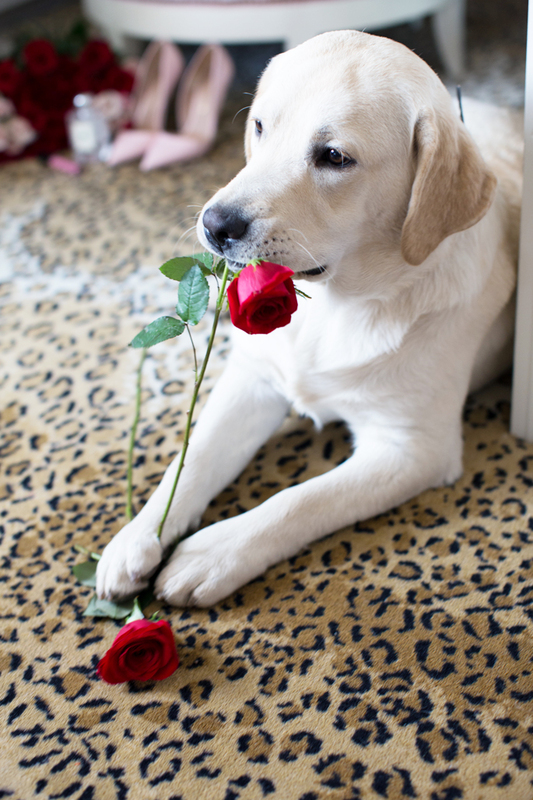 And your little pup with the roses is too stinking cute! Stunning outfit, Rach! I LOVE drew’s checkered shirt too. You both look great!! I’ve never tried a plum smokey eye – I usually go for brown, neutral shades, but the combination of plum eyes and a soft pink lip sound very romantic and feminine – perfect for the occasion! 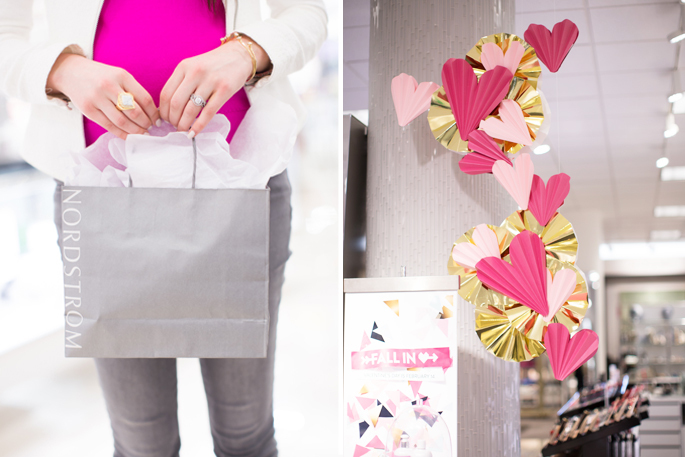 I love Nordstrom’s Valentine’s Day heart decorations – so pretty! This is such a beautiful Valentine’s post! LOVE! That coat is soooo beautiful. And the last photo of you with all of those roses is such a good one! Hi Rachel! What a cute post, love how you took us with you from the prep to the date night! You’re glowing and that red dress looks amazing on you! Such a cute bump! You look so beautiful – love the red dress! You are absolutely glowing! Everything that you wear looks FANTASTIC, Rach! I love the combo of pink and white! You look absolutely gorgeous in these pictures! Have fun at fashion week! Wow! Very pretty – look and roses! What a lucky girl! That pic of your pup is so adorable! My lab is not nearly that cooperative. You are just glowing!! Such a beautiful Vday look. Plus that cream coat really makes the red dress POP. You look fantastic. I always get little surprises for my daughters, too! 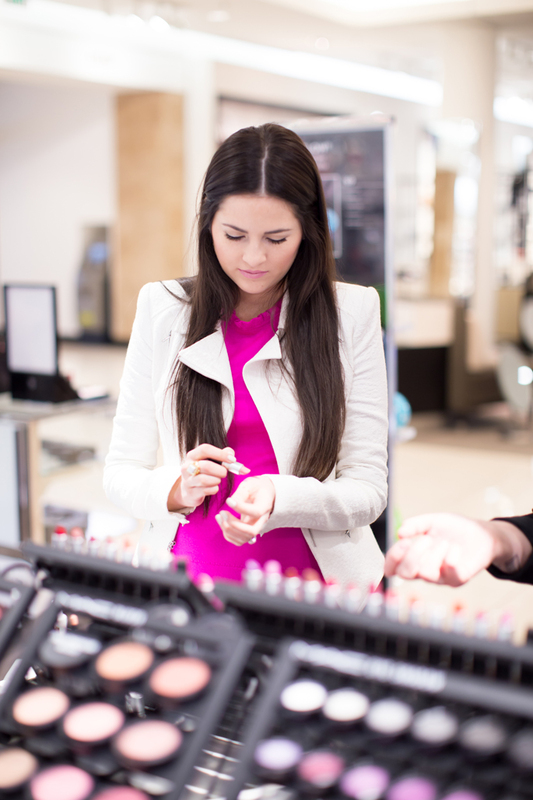 Who helped you pick out the beauty products at Nordstrom? I love the different shades that she/he picked out, especially the Guerlain Eyeshadow Palette. I am more fair in color than you and would love to visit with your beauty expert to see what they recommend for me! I love this look it’s so feminine and sophisticated! And the photo of Dash with the rose in his mouth is SO cute!! I love the makeup look you created, and it looked perfect paired with that gorgeous red dress. Hope you and Drew have a great time in NYC! such a sweet story about what your mom would do! :) happy v-day to you and Drew! The photos of you two holding hands are just adorable! 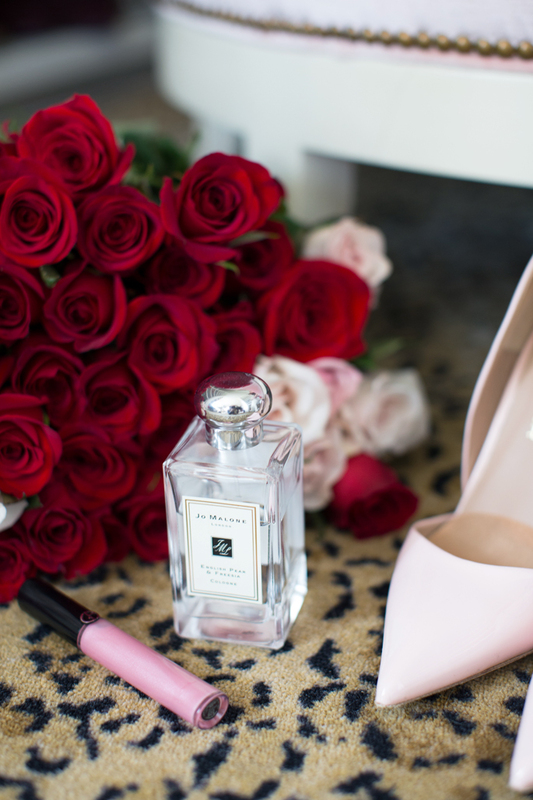 Love the Vday inspired post have stay warm in NYC! Great post! You look so beautiful in that dress and makeup! Love this dress. It is the perfect one for Valentine’s day! love the red dress, you look stunning! Love the red! It is the perfect kind of red! Such pretty photos Rach! I love it! 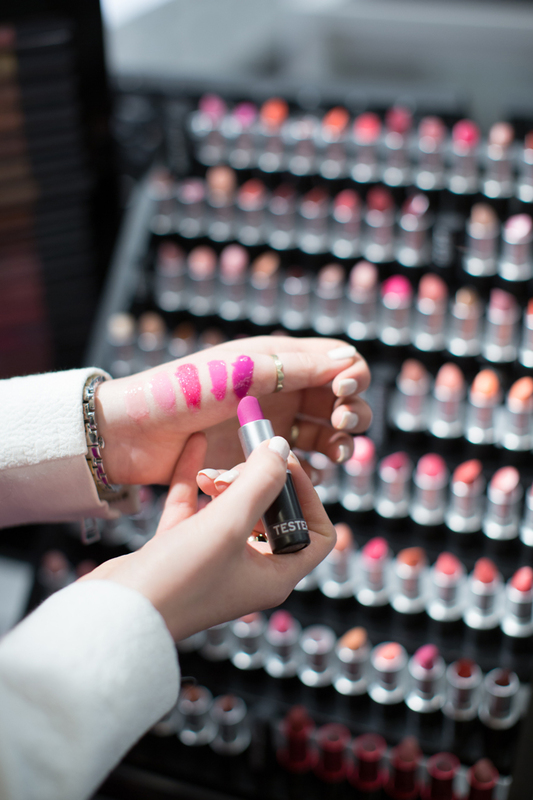 Great tips, I am fan of some of those make up items as well! adoreee the lip gloss! I am thinking of doing a Valentine’s Day list as well, I hope you check it soon ! You two look so cute together , your baby is going to be one good looking baby. 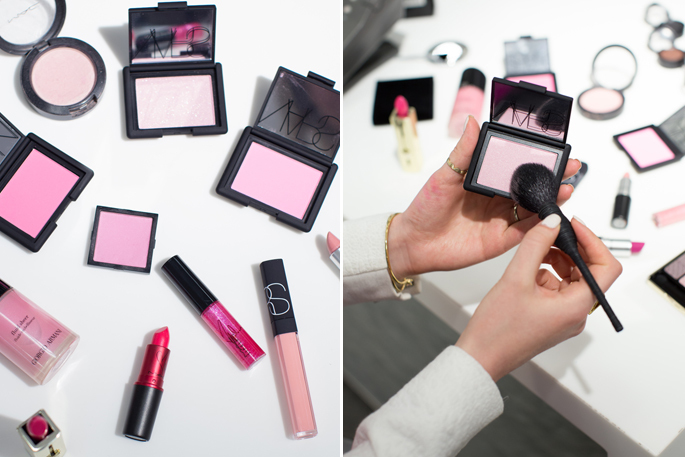 What is the name of the Mac blush in your photo?